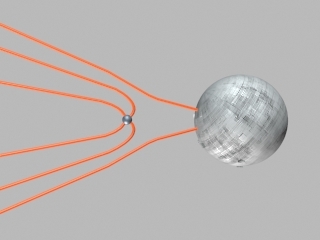 A point charge represented by the small aluminum sphere is repelled by a large sphere. The large sphere is charged, insulated, and conducting. The point charge carries a charge which is 1/50 of that on the large sphere. The electric field lines (in red) are computed using the potential given by Jackson equation (2.8), Section 2.3. The large sphere is taken to be infinitely massive, and the equation of motion of the point charge is computed using Jackson's equation (2.9) for the force between the two. The point charge is initially moving radially toward the large sphere at 9 radii (of the large sphere), with enough energy to reach 1.5 radii (only 0.5 radii above its surface), at which point it reverses direction. The animation ends when the small sphere returns to 9 radii. Again, this is an example of the pressure exerted perpendicular to the field. That pressure tries to prevent the charges from coming together.